Caffeine is a natural stimulant and the most common drug used around the world. It is found in tea, coffee, and cocoa plants. It works by stimulating the brain and allows you to stay alert by preventing the onset of tiredness. Historians first tracked the brewed tea containing caffeine as far back as 2737 B.C. However, according to a Chinese legend, the Chinese emperor Shennong accidentally discovered tea when tea leaves fell into a pot of boiling water and resulted in a fragrant and restorative drink! The earliest known credible evidence of coffee drinking or knowledge of coffee appears in the middle of the fifteenth century in the Sufi monasteries of the Yemeni southern Arabia. Caffeine can be used in a variety of foods and beverages; however, it is derived from a few main sources such as tea leaves, cocoa beans, kola nuts, and coffee beans. This is perhaps the most commonly consumed form of caffeine. An 8 ounce of coffee contains approximately 100 milligrams of caffeine. However, the serving size and the brand of coffee can also make a huge difference in the amount of caffeine present. Both diet drinks and soft drinks tend to contain substantial amounts of caffeine, a 12-ounce soft drink contains around 23 to 69 milligrams of caffeine depending on the brand. 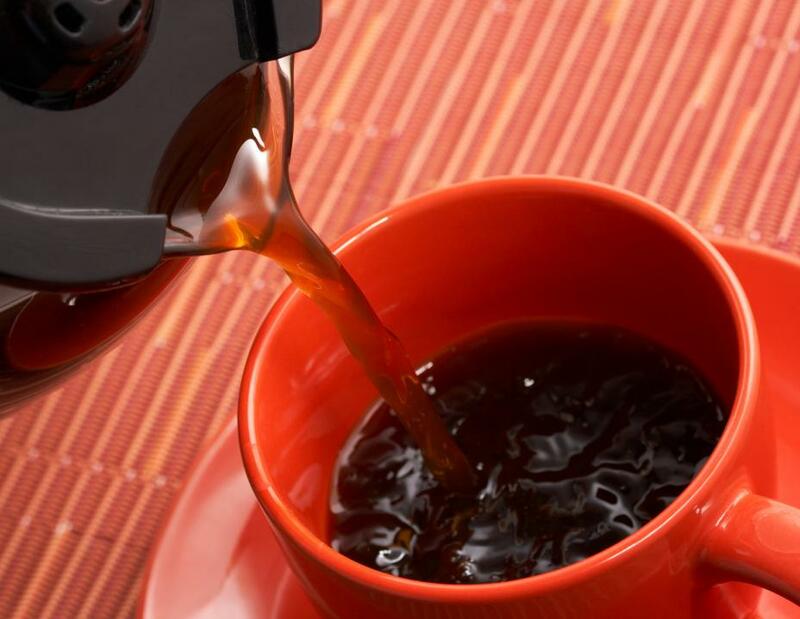 Some brewed teas, especially black and green tea contain certain levels of caffeine. An 8 ounce of black tea contains 35 milligrams of caffeine whereas 25 milligrams of caffeine is found in 8 ounces of green tea. Since cocoa beans are used to make chocolate, chocolate bars too can contain some caffeine! In general, the higher the level of cocoa the more caffeine there will be. An 1 ounce chocolate bar contains approximately 15 milligrams of caffeine. Caffeine stimulates the central nervous system, it is an effect that possibly starts 15 minutes after the ingestion of caffeine and lasts up to six hours. The main effect of caffeine is increased alertness and reduced sleepiness but the drug can also cause some problems. Excessive intake of caffeine can lead to long or short-term complications. Too much caffeine is known to produce certain side effects such as insomnia, difficulty concentrating, muscle tremors, fast heartbeat, heartburn, nervousness, irritability etc. Amita Vadlamudi, the author of this article is an avid reader of non-fiction books and author of articles on many topics. Some of Ms. Vadlamudi’s other articles may be found on her Slideshare and Behance websites. This entry was posted in Uncategorized and tagged Amita Vadlamudi, Caffeine, Chocolate, Coffee, Tea on September 11, 2018 by wpadmin.